Rabinowitz Public Service Award - Alaska Bar Association - Information about the mandatory Alaska Bar and the activities of the Alaska Bar Association. Beginning in 2003, this award will be given each year by the Board of Trustees of the Alaska Bar Foundation to the individual whose life work has demonstrated a commitment to public service in the State of Alaska. 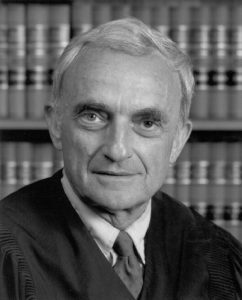 The Award is funded through generous gifts from the public in honor of the late Alaska Supreme Court Justice Jay Rabinowitz. Nominations for the award are solicited in the beginning of every year. A nomination form is provided below. Completed forms must be returned to the Alaska Bar Association by March 1. The award will be presented at the Annual Convention of the Alaska Bar Association. The Jay Rabinowitz Public Service Award carries the name of a man whose life in public service for the State of Alaska is legendary. Former Alaska Chief Justice Jay Rabinowitz was dedicated to the principle that all Alaskans are entitled to equal access to the judicial system, once observing in an opinion that “the judiciary in a multiracial jurisdiction, such as Alaska, must be peculiarly sensitive to racial discrimination”. He devoted much effort to improving the administration of justice in rural Alaska, overseeing the establishment of Superior Courts in rural areas and the expansion of the magistrate system for smaller villages. He also served as a mentor for countless attorneys, public servants and judges who can trace their roots to his Fairbanks chambers.